My big sister is engaged to the love of her life and Hokie, Dave! GAHHHHH!!! A few weeks ago Dave met me and Sarah for dinner. 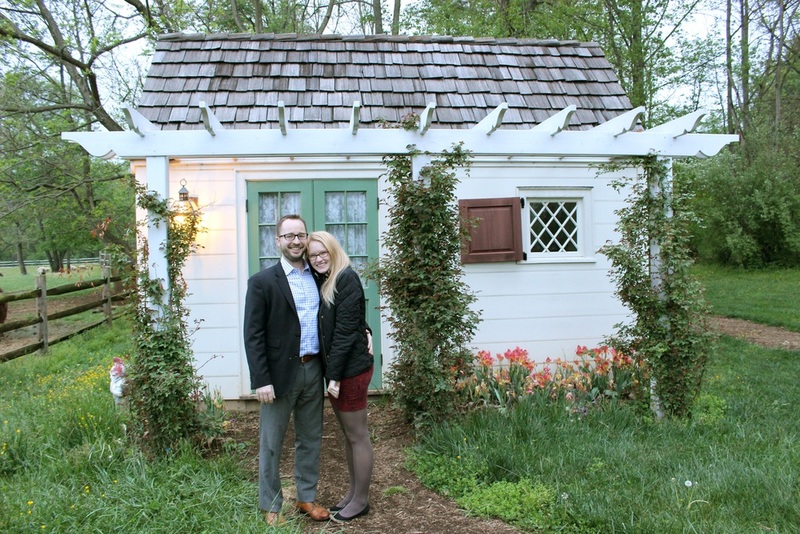 Over glasses of wine, we formulated a loose plan of where and how to do it, all on Dave's intention to pop the question at the Inn at Little Washington. Ebeth thought they were simply checking the world-famous restaurant off their bucket list, and to celebrate Dave's recent admission to MIT. Fast-forward to Friday, April 29. Grant, Sarah, Dave's brother Jon and I left around 3:30 p.m. for Washington, Va. After dinner at the world-famous Five Guys in Warrenton, we headed to the Inn to scope out the property. They were in the middle of their 2-hour, multi-course dinner when we arrived. We took Grant's Honda Accord Sport since he has pretty (illegally?) tinted windows, LEAVING NOTHING TO CHANCE if they happened to be outside for some reason. Post office and cafe, our vantage point for the Inn! We sent for a staff member who knew about The Proposal, and he had us park our car in view of the Inn and took us around the property. The manager planned on giving us a head's up when they were getting their check and "going for a walk" (sneaky Dave!) so with the little time we had before the proposal, we hunkered down in Grant's car and waited. The rest of the story is more visual, so below you will find a sampling of behind the scenes shots, captions are below each photo in bold. Sarah and I ended up hiding in that cluster of evergreens! This llama will come into play later. REMEMBER THIS LLAMA. Foreground: New llama. Background: Same llama as before. IMPORTANT LLAMAS. Sarah doing her best Dave impression. Once we got the signal from the manager that they were paying their tab, Sarah and I were too excited to wait any longer so we RAN from the car parked near the inn over to our hiding spot in the trees. Sarah saw Ebeth and Dave pop in to their little cottage (The Mayor's House) and so we had time to get into position. I was testing my camera settings and hoping for the best view possible! This was going to be hard because Dave had no idea where we were hiding. EEK! Sarah and I hiding out in our cluster of evergreens! Grant and Jon were closer to the Inn for a different viewing spot. This is how far away we were! But we were pretty hidden. There's a slight heart shape in this photo which I totally planned. GAHHHH HE'S DOING IT! At this point, I sprint out of the trees to get closer, hiding be damned. It's happening! Trying with all my might not to cry and shake the camera! Still getting closer!! If you look to the far left in this photo, you can see the livestock caretaker who saw the whole thing go down! Hey Leeds!! This is when Dave showed her we were all there! As is tradition, the future bride and groom hand-fed the two llamas, who act as guardians of the flock of sheep. Back to their cottage for champagne!! Congrats to Leeds and Dave! Love you guys and I can't wait to start planning!